As Parade Chair, all I can say is 'Thank you' to all the volunteers and participants that made this year's parade such a success. No, I mean it. That's all I am really justified in saying because everyone else did the actual work. Ken Leung told me when he handed over the reins that it would be mostly a matter of letting people do what they already love to do in support of the parade effort. I now see how right he was. And the results of all these contributions were truly magnificent this year. Putting my name on the bottom of a couple emails was not my big reward for this: I was far more inspired by the admiring looks on the faces of the parade spectators and the enthusiasm of our children even after smiling their way through what was in actuality a long ride on a chilly night. The reactions I most appreciated were from other parade entrants, marching bands, corporate floats, lion dance troupes - people who had every reason to stay focused on their own part in the parade but who took the time anyway to marvel at our snake as it passed by. I shadowed the float for many blocks and the reaction was always the same: dawning excitement, usually followed by exclamations like "Those kids are so CUTE!" or "Check that out- it's made of paper plates!" So we certainly accomplished one of our two main goals, representing our school proudly to the local community and the wider world. Our other goal was to show some of our students a good time as they participated in this unique celebration of Chinese culture. I think that worked out pretty well also. Of course, let's be honest, it's not every year we get great TV coverage and fine weather. I won't pretend to claim credit for that either. But it is nonetheless true that I got many personal notes, some very touching, from families and volunteers alike saying they really enjoyed the opportunity to be a part of this year's parade. So I will take that as a sign that we achieved our goals in that respect as well. 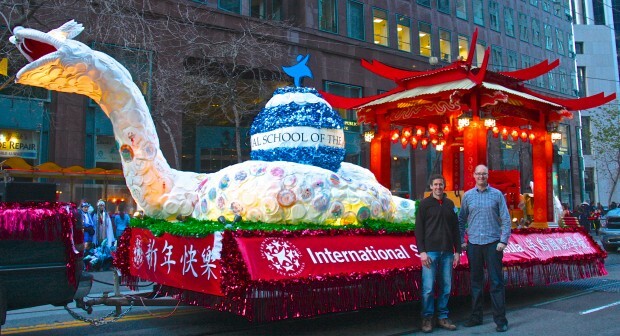 Gary Meeker More than anyone else, Gary is the reason for ISTP's continued success over all these years of participating in the Chinese New Year Parade. When I started, Ken told me my main job was really just to make sure nothing blocks Gary from doing his amazing work. Many can provide support, but ultimately Gary provides the float. Stephen Sun Stephen supplied the spirit and the vision for the float and then proceeded to show up at every work party to actually pitch in and work side by side with everyone else doing the grunt work of turning that vision into reality. Total follow-through. Big picture, attention to detail, Stephen has it all. Todd Carper I am not a Latin expert, but I truly believe the phrase sine qua non applies to Todd this year. We would still be under a tent at Cowper hoping our tools were still there from week to week without him. Plus his shop is a making-stuff Disneyland. This year finding a suitable workspace was our most acute need. Todd came through. Julia Wei I relied on Julia more than anyone else to decide what to do this year. She was a trove of historical information and general common sense: there is no drama when Julia is involved. But more than just providing guidance, Julia personally handled all of the merchandise procurement and sales and was our single point of contact with the restaurant for the banquet. Indispensable. Gladys Lim Trusted with the actual welfare of the kids! This event is about the kids and, as a veteran of many parade campaigns, Gladys solved my single biggest worry when she volunteered to personally organize all the kids and their families again this year. At one point I realized she had it totally under control and I just had to simply step back and let it happen. Plus she handled all the costumes for young and old, including Philippe's amazing "Emperor" costume! People took almost as many pictures of Philippe as the children. Elise M. Volunteered early and often, offering to sell merchandise at Cohn and then stepping in with crucial logistical support when I realized there were only two days to distribute all the tickets after we received them. Andy Farlie Provided the truck. Andy was a good sport and consented to having last year's massive dragon head mounted on the front of his vehicle to look good for the TV cameras- that's dedication. Dave DelGrande Not only was the snake body covered entirely in paper plates (some decorated by our very own Cowper students! ), the head itself (as featured in a nice, long, spectacular close-up shot on TV) was ALSO in fact made of the very same medium. How Dave got paper plates to conform to such an intricate and life-like sculpture I will never know. He is a true artist. Phil Brooks Provided key design and fabrication support for the float- very specialized skills, very necessary skills for what we are trying to do. Karl Kneip Did early research and prototyping for the rotating globe that we used on the float. Oh and he paid for everything. Kate Wilson and Rachel Chao Both volunteered to sell merchandise at Cowper and ended up selling dozens of items. I thought that was good enough but Kate pushed me to let her go again the following week and scored another $200 in sales. Great volunteer spirit. Lorin Sharp Eager and enthusiastic, present at every stage from the very first meeting to the last ticket sold. Jovi Craig Many times this year I was surprised to see an "official" communication from ISTP about the parade - maybe on the marquee at Cohn or in a weekly newsletter - that was timelier and better written than anything I would have thought to do. She connects the parade team to the whole ISTP community. And with great patience. Mathieu Farrugia In a former life, I had a career in IT. I know how rarely effective IT support is recognized. Let this be one of those times. Patricia Colin Helped establish the importance of the parade this year with early guidance and advocacy. Monica Botimer A crucial source of "institutional knowledge." Her willingness to share her experience so generously was appreciated. Claire Lin Great snake design! See post script. Haydee Felsovanyi and Lillian Kurtz Many of us have heard the saying 'if you didn't document it, it didn't happen.' Thanks to our photographers, the event "happened." Diana Kong and Philippe Dietz Let's give the last word to our leaders who personally accompanied the kids on a ride they will never forget. It is not just the kids who were reassured and inspired by their personal commitment to representing ISTP to the world! ISTP has been doing this parade now for 13 years (we are finally starting on our second pass through the zodiac!) and the dedication of certain volunteers and "institutional knowledge" that has accumulated is really remarkable. So I have every confidence we will continue to dazzle the crowds and provide our young students with unforgettable experiences for years to come. I hope they let me do this again - it's the easiest job at ISTP!